Companies that offer DCIM tools position them as essential, promising a holistic view of the performance of a data center. The DCIM market went from volatile to pretty stagnant, though a buyout between two of the major vendors could jump start demand. There are several problems with data center infrastructure management (DCIM) tools at the moment. DCIM tools can be fairly complex and IT pros may initially be overwhelmed with the amount of information the tools provide. Going all in with may even require organizational changes, so slowly adding tools is probably a better bet. 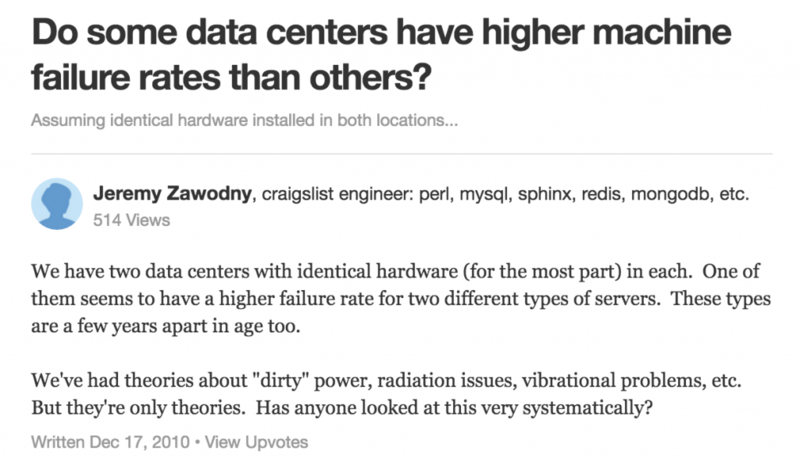 These three comments highlight the broad points of view around the industry about DCIM. There’s more potential in DCIM than power and cooling measurements or even asset controls. According to data center facilities expert Robert McFarlane, DCIM tools will fall away from the forefront, but that might not be a bad thing. “DCIM will become less of the big industry buzz word and settle down into the background,” McFarlane said. He doesn’t think that means DCIM will be less important, but rather, that IT pros will take a close look at DCIM when they want to track a specific metric in the deployed infrastructure. Some in the industry even see DCIM being essential to preventative data center maintenance. Potential users who invest heavily in DCIM tools today expect a broad, integrated platform that isn’t always reality. 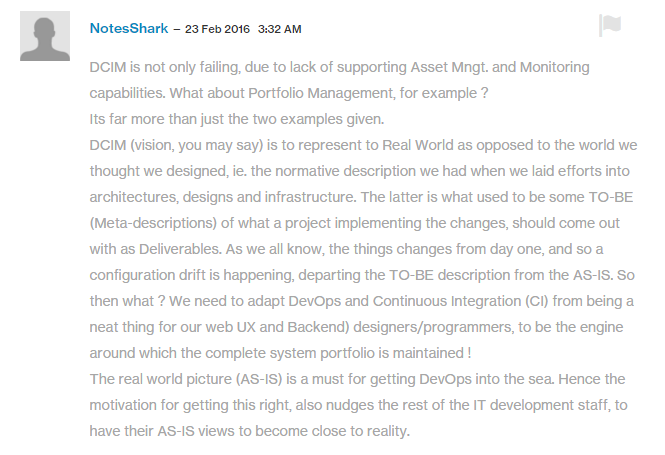 Commenter ‘NoteShark’ detailed this disconnect between expectations and reality in response to Robert Gates’ story “Buyout could give stagnant DCIM tools market a boost” from February 2016 (linked above). For some, configuration drift seems to occur due to the ops and facility teams only having a normative description on which to base their designs — from racks to system architectures. When the tool doesn’t have input from everywhere in the stack from facility to app, DCIM tools don’t live up to their fullest potential. And while configuration drift can happen at every level, ‘NotesShark’ goes on to say how a DevOps -type of IT environment, where there is more communication and a better flow of information between dev and ops teams, would benefit most from thorough asset and portfolio management alongside current DCIM tools’ abilities in facility and hardware tracking. Where do you stand on DCIM tools’ usefulness and their future? Reference Jeremy's comment, all the common causes for box failures are not transparent to us because we just now implementing DCIM across 2 datacenters and it is a tremendous uphill learning curve to get to the benefits.